You can either add the extention or not, it doesn't matter infact. I never bother doing it. Also, it's best to not rename anything. And a file won't magically load another file with the same name just because they matches. It's the symb.bin file that loads all the files (unless I'm wrong or if there are exceptions). Unless you meant renaming the files taken from other games to the names of the one from NSMB's .sdat? Yeah you need to do it. But many music from other games aren't compatible with NSMB, too heavy or just not fit to load in levels. Making music that's not fit to work in levels actually load is sometimes possible but not always easy. And yes the sound_data folder was intentionally kept with the same name. When repacking it, you get a sound_data.sdat file that has the same name than the default on from NSMB. So it's an issue of music impossibility for my particular tracks that I'm trying to import? Okay. I think I'll just stick with the vanilla tracks, they aren't that bad, right? I don't know what tracks you tried to import so I can't confirm it. And uncompatible tracks can't cause the sdat to be completely silent, so if it is then the cause is something else. Hmm... interesting. So the silencing isn't to do with the music itself then? Also, the music I tried to import was a track from Pokemon Mystery Dungeon Blue Rescue Team. I used VGMtrans to extract each part of the music and it exported without problems. I did notice that the file size for the Wave file was nearly 5 times larger than the original NSMB wave files. I have a feeling that may cause issues, but I could be wrong. Does all the tracks use the same wave file or something? The track won't load if it's really too heavy. Wow... just checked it out again, turns out they all really do use the same wave. I guess that explains why it broke the entire sound system. I guess I should probably find a different game to rip music from? No matter how heavy it is, it shouldn't prevent the whole sound system from loading.. I've been at this whole music hacking thing for 48 hours straight, and I've worked my way around many problems, but this one is one I just can't seem to tackle. Prior to the Command Prompt step, I have successfully done everything else. Unfortunately, this step wasn't very detailed and there wasn't a lot to follow. I've tried many different ways of writing the prompt and this was the closest I got to solving the puzzle. What am I doing wrong? Have I mis-typed something or does my midi just not cut it? actually the midi2sseq program is for 64bit not for 86/32bit, i already try to convert my midi to sseq and it doent work for my computer, maybe not? Also, even if it's somewhat old now, here is the thread for a music hacking tool: DSSS (DS Sound Studio). As pointed out in the video description, that's got no chance of working in a level. Even if one used the Opera Expansion Pak for RAM, I imagine there's not enough processing power to keep the game running without slowdowns. I've just tried importing music from another DS game again, and I noticed something peculiar. It seems that whatever I do, my custom-made Sdat file will always cause the game to be silent with a few knocking sounds. As a little test, I thought I'd try making an Sdat file out of the unchanged edited sound_data folder without any custom music. Guess what? Silence also, even though it should have worked by all means. This means it isn't a problem with the music, but rather a problem with NDSEditor. The written guide is very vague, so I must be doing something wrong. Does anyone have a video guide on making Sdat files? Or at the very least a guide with clearer instructions? I could really use some pin-point accuracy with this method. Edit: just noticed that NDSEditor seems to automatically sort the wrong file folders into the wrong part of the Sdat (e.g. the SSAR files in the SBNK part). I'm currently not sure how to rearrange the files correctly. Edit 2: I tried rearranging the folders so that the SSAR files would be in the SBNK folder and the SBNK files would be in the SSAR folder, in order to work around NDSEditor's errors. The resulting Sdat was not only completely silent, but also created visual glitches like the models doing some kind of weird skewy thing. After that I put the original Sdat back in (direct original from NSMB, not one made using the sounds folder) and the music is vanilla for the meantime. I really hope someone can troubleshoot this problem. 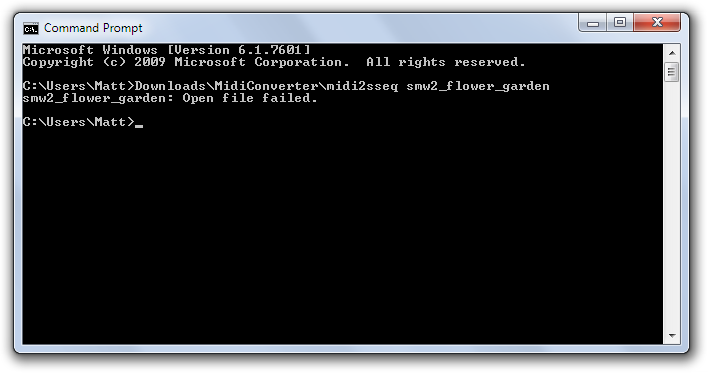 I'm really sorry to be such a bother, but I really cannot work out how to create a working Sdat file using NDSEditor. I've been tinkering around with things so many times, yet it always results in a silent Sdat file. Because my last comment went completely ignored, I've made this update in a new comment as opposed to another edit. I've recorded a video displaying the precise method I've been using to create my non-working Sdat file. Evidently, I'm doing something wrong, so I'd appreciate it if someone could instruct me on how to do it correctly. Thanks. How did you get the extracted SDAT file? If you just extracted the file with NDS Editor and didn't do anything with the filenames after that, I may know the cause of the silence. If you extract a SDAT file, the files will be listed alphabetically in Windows Explorer. This is not the right order of the files. If you take a look at the files in NDS Editor or VGMTrans, you'll see that the files aren't ordered alphabetically there. If this is the problem, you'll have to rename the files, so that the files will be ordered the way they have to be. The easiest way to do that is setting numbers before the original file name. You don't have to worry about this. The words 'SSAR' and 'SBNK' are probably swapped by accident. If you're going to rearrange the files, then the SDAT will definitely not work. I've just spent 4+ hours renaming all of the files to match the numbers from the sound_data_smap. Thankfully, it now plays sound! Thanks KingYoshi for finally troubleshooting the silencing. The downside though, is that the sequences are all muddled up. For example, world 2's map now plays a desert soundfont version of the Bowser Jr theme. I have no idea what's gone wrong since I followed the numbering down to pinpoint accuracy. Hmm.. I don't know what went wrong either. But be aware that the SSEQs aren't in the same order as the SBNKs and SWARs. You’ll need from out of the NSMB DS rom all the extracted files that are in the sound_data.sdat file which you can get using the NDS Editor. Bare in mind, you will need to re-organize the files around before compiling it back up; or you can use the modified sound_data folder (get your copy here) which already does all that for you. You can read more about it in the LAST MINUTE INFORMATION section. I would like to conclude this guide with some last minute information relating to a lot of the stuff this guide has covered. When I first started using the NDS Editor to hack NSMB DS, I kept running into a problem where the sound and music would completely mess up every time I replaced the games original sound_data.sdat file with one that I compiled; even when no changes were ever made to the compiled file. What had happen is the program would compile a new sound_data.sdat file, putting each of the file formats (*.sseq/*.ssar/*.sbnk/*.ssar/*.bin) back into their designated folder but in alphabetical order instead of in the listed order they were in originally. The files would then be renamed to reflect the listed order they were in originally even though the name doesn’t match the actual file; this can be seen when browsing through content of the sound_data.sdat file using the NDS Editor. So I started re-arranging all the files in the sound_data folder; renaming them (you can do this with/without the file extension) so that everything would go in the order it was supposed to be in once compiled and it worked. For those of you who don’t want to go through the hassle of making your own sound_data folder, I’ve provided a copy of this modified sound_data folder so that you can compile your own *.sdat file with ease. Get your copy of the modified sound_data folder here. Did you use a modified sound_data folder? I'm quoting this part again as everyone seems to miss it. Treeki renamed all the files for you, and all the musics works all fine. Oh also it starts to come back often.. Yes, but unfortunately, that sound data folder is not the original one from NSMB but the one with the changes from Orengefox's music hack. Nope. It's not. Check by yourself, the only thing modified are the file names. 01, 02, 03.. I've been using it for years. It's a different thing than the music hack he released. Treeki did this already and released a copy he linked in the tutorial twice..
Anyways, now I've downloaded the correct one, and it works fine! Now I can finally experiment with custom music. Thank you people so much; I promise I'll make it up to you guys with NSMB Empire. No problem, I'm glad we could be of help. Good luck with music hacking, I'm looking forward to see what you can do. I was getting bored of keeping quoting that part of the tutorial, I'm not quite sure if it's been four or five times.